This Christmas, I created some coffee charms for a good friend of mine. 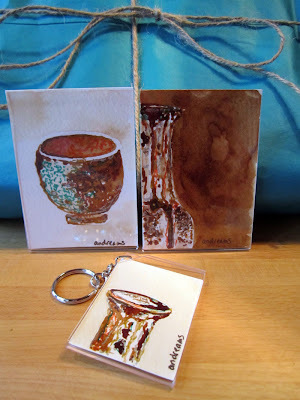 He is a potter and so I used images of his work as the inspiration for three tiny coffee & ink paintings. I slipped two of them into fridge magnet frames and made the other one into a key-chain. He was pleased - especially when he recognized the work as his own.